I tossed Magic Bites into the my last Amazon order, mostly because of the Patricia Briggs quotes on both front and back covers as well as several positive blog reviews I'd read. 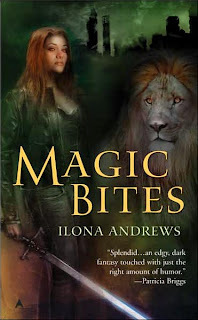 The most fascinating thing about this book is that the author's name, Ilona Andrews, is actually a combination of Ilona and Andrew Gordon's first names. They are the husband and wife team who create the Kate Daniels books. That is to say, together they come up with the characters and plot, then Ilona writes the book, and finally the two of them wrangle over editing/general clean-up. Awesome, no? I have to say what I liked best about this first book is the crazy, psychedelic Atlanta it takes place in. This alternate city is saturated in daily waves of magic that doggedly eat away at any signs of civilization and/or technology. The city's skyscrapers are no more than dwindling piles of granite and steel. Magic and technology are basically anathema in this world and the inhabitants of Atlanta live a sort of refugee-type half life. Having adapted to the dark surges when the electricity and cars stop working and people take to horse-drawn carriages and camp stoves. During these times the supernatural rules and mere humans get by. It reminded me vaguely of the gritty, post apocalyptic world Robin McKinley created in Sunshine. The vampires share a few common characteristics as well, their extremely gruesome appearance being at the top of the list. It's nice to see someone else bucking the current beautiful and seductive trend. Not that I have anything against your run-of-the-mill sparkly vampire. It's just fun to see the ubercreepy version as well. The reader is dropped into Kate Daniels' life without a by-your-leave. Being the somewhat cantankerous reader that I am, I like it when a book challenges me to keep up, grabs me by the throat, shakes me once, and says, "Immerse yourself or be left in the dust!" In this world where humans exist side by side with creatures straight out of mythology and nightmare, it was a treat to attempt to navigate it without having everything spoon fed to me. I like Kate. She does share some characteristics with Briggs' Mercy Thompson. She has a sense of humor and she ruthlessly guards her independence. Kate's a bit rougher around the edges than Mercy. She's had a rough past, undoubtedly, but one of the strokes of genius in this series is that the reader doesn't know what Kate is. We know she's something. But we don't know what. And Kate is determined not to tell anyone. Not even the reader. Oh, we'll find out eventually. But I'm all tingly with the mystery of Kate and her powers. Oh, and the second paragraph of your review made me laugh. Nice review =] This book sounds good! Thanks, Steph! Yeah, I enjoyed this one. I should have my review of the sequel up soon.